There is so much to plan for as you prepare for your upcoming trip to the Blue Ridge Mountains. Kick your legs up and let us take the pressure off! Below are a handful of frequently asked questions that should help with planning. If you still haven't found the answer you are looking for please contact our office for additional assistance. Check-in is at 4:00 pm; check-out is at 11:00 am. We do have options for early check-in in and late checkouts, if available. Please contact us for further information about these options. Your balance must be paid in full 10 days prior to arrival. Unless you have made a reservation within less than 10 days of your reservation date, we can take reservations as late as same day check in. For Thanksgiving, Christmas, and New Years reservations must be paid 30 days prior to arrival. There is now a Wal-Mart in Blue Ridge! It's located next to the Home Depot on Hwy 5. What are the Terms & Conditions with GMC? Guests can review the agreement online and contact our office with any additional questions or concerns. Office Location: 3608 East First St. Suite 103 Blue Ridge, GA 30513. * Note: Although some of the items listed above are available at most cabins we cannot guarantee each item is available in every cabin. * Note: First aid kits and fire extinguishers are available. Medicines such as Aspirin / Ibuprofen is not provided at our cabins. You must have your reservation paid in full 10 days prior to check-in (15 days if paying with a check), 30 days prior to arrival for Thanksgiving, Christmas, and New Years reservations. Payments made, other than the initial $250.00 deposit, should be made by calling 1-877-656-7368 or 706-632-5751. We accept Visa, MasterCard, AMEX, Discover, personal checks. Our system automatically charges guest balance within ten (10) days of arrival or thirty (30) days prior for Thanksgiving, Christmas, and New Years reservations, on the credit card that was used to secure reservation. Each reservation is charged a non-refundable fee of $60 for a Damage Protection Waiver. This waiver is designed to protect you from charges due to accidental damage only. The DPF can provide up to $500.00 to repair accidental damages (beyond normal wear and tear). If any damages surpass $500.00, additional charges will be applied to the credit card on file and written documentation will be sent to the Guest(s) of record. If damages are determined to be caused by the willful misconduct, misuse, or pets; the Damage Protection Waiver will be voided on the grounds of an intentional act(s), gross negligence, willful and wanton conduct by Guest(s) or Licensee of Guest(s), or visitor. These occurrences will result in the Guest(s) credit card on file being charged in full for any damages and management fees. The waiver does not cover any additional management fees or fines. All accidental damage must be reported to the Georgia Mountain Cabin Rentals office before guest departure to qualify for protection. If I accidentally break something am I automatically covered by the Damage Protection Fee (DPF)? No, A guest MUST REPORT any damage to the property during their stay to qualify for full coverage. If the damage is discovered by our Property Care team after departure the DPF waiver can be denied. Please report any damage if it occurs. If it denied, then the guest will be responsible for any damage charges. Yes! All vacation rental management companies, Lodging, and individuals are required to charge Taxes on their properties. There are two types of taxes that must be charged. 1) Lodging Tax, this is a tax that is figured on the nightly rental rate. North Georgia varies from 10 to 12% based on the county. 2) Sales Tax. Sales tax is charged on any mandatory service or Fee that is added to a reservation. Example: Cleaning and/or pet fee. The total lodging tax in Fannin County, GA is 12%. You will be provided with directions to your cabin upon check-in to the cabin. Do you have pet-friendly cabins? We have some pet-friendly cabins. This option is stated on the cabin profile and is possible with a non-refundable pet fee. Pets cannot be left in a cabin unattended. Some of our cabins are located in the general vicinity of other cabins but all cabins are privately owned and are spread throughout Fannin, Union, and Gilmer Counties. We have several groups of cabins that are walking distance from cabin to cabin. Gift certificates are thoughtful and unique gifts for friends, family, or business associates. You may specify a specific dollar amount on any gift certificate. To order please call the office at 1-877-656-7368 or 706-632-5751 or email the request. All cabins are non-smoking and this policy will be strictly enforced and there will be additional cleaning charges should it be found that someone has violated the policy. There will be a $250.00 minimum charge for anyone found smoking in a cabin. View availability and make your reservation online or call our office at 706-632-5751. A Rental deposit of $250.00 due upon making the reservation over the phone or booking online. The person booking the cabin must be at least 25 years old and must be either the person, or the spouse of the person whose name appears on the credit card. In the North Georgia Mountains, you should not need a special vehicle (4x4), but we do suggest if you are driving a sports car or other low sitting vehicle that you contact the office first before driving to your Blue Ridge cabin rental. Please check with the office regarding cabins that could require 4 x 4. If you are riding a motorcycle, please call the office first. Some cabins will be more difficult for a motorcycle to access. If you plan on towing a trailer, please call the office first so that we can advise if the cabin you will be staying at is accessible for a trailer. Cell phone service is somewhat sporadic in the Blue Ridge mountain cabin rentals. Most of our cabins have cell phone coverage. VERIZON and/or AT&T seem to have the best overall coverage, but some of our cabins have no cell phone service available at all. SPRINT has limited coverage in the Blue Ridge area. Each cabin has a landline which provides local calling. Please bring a prepaid calling card for making long distance calls. Ingles Supermarket is located on Hwy 515 in Blue Ridge, GA. Also, there is a Food Lion in Blue Ridge as well. In addition to these two larger stores, there are Sav-A-Lot, and a couple of other mom and pop grocery stores as well. If you or your guest(s) accidentally leave a personal item at one of our cabins, please contact us ASAP. If we find the item we will make every effort to contact you to make arrangements to return the item(s). Either way, we will act as quickly as possible. During our busier seasons, this may take up to 14 days to return certain items. If we do not locate the item(s) before you bring it our attention it may be irretrievable. If we are requested to return the item via parcel post-USPS, we will return item(s) including packaging for a minimum fee of $10.00. The fee for returned items can be charged to the credit card on file or another credit card. You may also use other shipping arrangements using a UPS, FedEx, DHL account. You can purchase package beer and wine in Blue Ridge or Copperhill, TN. The restaurants of Blue Ridge serve beer and wine by the drink. Copperhill, TN serves beer and wine by the drink in the restaurants. You can purchase alcohol either in Ellijay, GA or Murphy, NC. Both of these cities are about 30-45 minutes from most of the cabins. For cabins with wood burning fireplaces, firewood is provided. The fireplaces do not have a gas starter so, if you are not proficient at starting a fire without one, you might want to bring small "Duraflame" type logs or "Fire Starters". Firewood is provided only for wood burning fireplaces. Firewood is not provided for fire pits and outdoor fireplaces. You may not cut wood surrounding the properties but small bundles of wood can be purchased at the local gas stations and grocery stores. Absolutely no liquid accelerant is allowed! These are very dangerous to you and our property. Your full deposit will be kept if one is used! 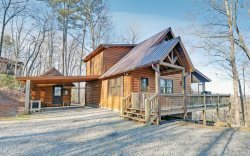 Any of our North Georgia Mountain Cabin Rentals that have wood burning fireplaces inside the house will have firewood supplied at the cabin. For cabins that have fire pits outside, you may need to get firewood and take yourself. There are several places in Blue Ridge, GA that you can get firewood in bundles. Please ask us and we can help direct you. Looking for something in Blue Ridge, GA? Visit our Local Area Guide or call our office to speak with one of our knowledgeable and helpful staff members. Feel free to contact us anytime at (706) 632-5751 with any additional questions you may have!